~Do you want more ease in your movement? ~Have you Felt your Posture needs improvement and don’t know how to change it? Do you feel awkward and want more ease in your movement? Then this class is for you! There is nothing like social support so Bring a Friend. We will be covering Alignment, Strength and Balance as we progress this class. 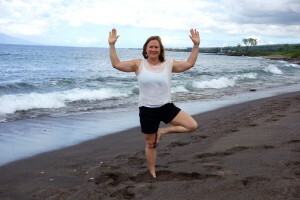 These are some pictures of me doing Yoga on one of the Black beaches of Maui. Wherever you go, there you are -doing yoga! Alignment is determined when your joints are Centered from one segment to another, no one part is feeling all the work, the forces move through from one part to the next, effortlessly. Starting with your feet, balancing each segment on the next ensures the best alignment for your body. Strength, when based on good alignment- is much stronger than built on a faulty foundation. Being strong within your range of motion creates dynamic stability and resilience-we all want a little more of this for healthy aging. It is more than just your CORE! Balance is assured when your alignment is over your Base of Support and sufficient strength is in place. You will never fear falling if your balance is intact! *Start the Summer right by creating a solid foundation of Mindful movement. Consider starting with me to tune up your Alignment, Strength and Balance before you sign up for a gym or Yoga classes! You will improve your awareness, and be able to move ahead with any fitness program and take it higher! Are You on the Sugar Roller Coaster? Set Up for Fitness 2016~Start your Resolutions off Right! How to get Your Kids to Eat Better-and Why you Could too! Contact Me for a Free Consultation. Reclaim Your Optimal Body Balance and Find Freedom Today!